It's sometimes hard to see a bright side when something truly terrible happens, but for a bereaved Florida family the surprising return of their pet dog has helped ease the blow of a violent tragedy. On January 7, 22-year-old Blake Talman was attempting to flee the scene of an accident in Sarasota when he lost control of his Nissan Altima at high speed. The car struck and killed Donna Chen, a mother of three who was jogging with her dog Barney, before crashing into another car and several roadside poles along State Road 758. Talman, who later admitted he was drunk at the time, and a friend were hospitalized. That afternoon, Rory O'Connor was paddling his kayak out into Sarasota Bay for an afternoon of fishing. His video camera, mounted on the nose of the small boat, shows him baiting some hooks until he is distracted by a splashing noise. The small blob in the water moving towards his craft was a dog, swimming out several thousand feet from shore. 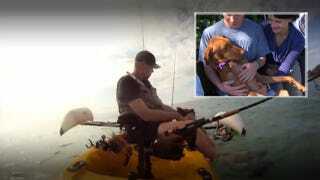 Quickly pulling his line in, O'Connor reached out and pulled the terrified Vizsla into the kayak with him and headed for land. A check of the dog's microchip ID implant proved that the small brown dog was Barney. He had been injured in the crash, but was able to run from the scene and inexplicably went swimming away from shore. The traumatized Barney is ok and has been reunited with the Chen family. "I think a higher power lead Barney to where he needed to be because out of this horrible tragedy there is something remarkable that happened. Her puppy is alive," Chen's sister Eduardo told ABC Tampa. "We are focusing on Barney and appreciating his life and celebrating his life." Talman faces DUI manslaughter, DUI property damage, and personal injury charges related to the incident.